When to transition your baby to table food? 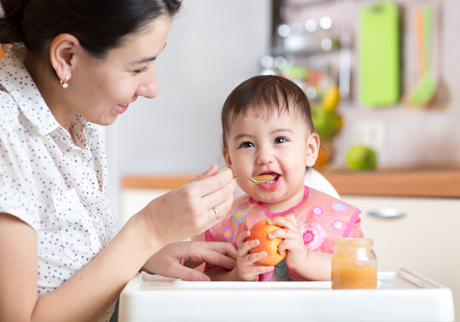 Introducing your little one to table foods isn’t about nutrition alone, it’s also about bringing your baby into the family’s mealtime routine — having him eat with you, enjoying many of the same foods that the rest of the family eats. “By the time a baby is a year old, he should be getting a wide variety of family table foods, as long as the family diet is healthy with not too many processed foods or foods high in sugar or sodium,” says Ellen Desjardins, public health nutritionist with the Region of Waterloo Public Health in Ontario. Think of this period between nine months and the second birthday as a “window of opportunity” when it comes to introducing your baby to table foods, says Louise Lambert-Lagace, a Montreal-based dietitian and author of Feeding Your Baby the Healthiest Foods. While three out of four one-year-olds are willing to try new foods, among two- to four-year-olds, only one in ten will be as adventurous. “Have fun with variety, and let your baby taste lots of new foods and flavours,” she says. These are messy times, but understand that when your baby squishes some banana through his fingers, he’s just discovering his food. Along with healthy meals, your child gets a lot of important messages at the table. He learns that a meal is a sociable time when he gets to enjoy the companionship of his family. And, he learns about good food choices by watching you. • Puréed cooked meat, fish, chicken, tofu, or egg yolks. • Dairy products such as yogurt, cottage cheese or whole milk (homogenized 3.25 percent butterfat). Pure cow’s milk is too hard on little stomachs and isn’t a good source of iron. • Egg whites (although egg yolks are OK after six months). • Honey—the bacteria that cause infant botulism, a potentially serious disease, can grow in honey. Although this is rare, especially in Canadian honey, Health Canada advises parents to wait on this sweet treat. If you have a history of allergies in your family, avoid introducing peanuts, tree nuts and shellfish until your child is three years old.